Who doesn’t love a candy bowl? 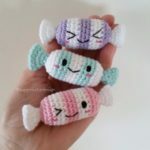 If you’d rather not have the temptation of real candy however, you could always crochet a bowl of these cute candy amigurumis from Jennifer at Super Cute Designs. The pattern is free on the Super Cute Designs website, and it is in English, using U.S. crochet terms. You’ll need two colors of yarn (you can use cotton, acrylic, or a mix), a size “D” crochet hook (it will depend on the yarn you’re using), a tapestry needle, polyester stuffing, and black embroidery floss. You’ll also need to know the following crochet stitches: Magic Ring, chain (ch), single crochet (sc), one stitch increase (1 inc), and one stitch decrease (1 dec). The middle of the candy is crocheted first in alternating colors, followed by the two sides of “wrapped paper” that will be attached later. You’ll also be sewing in the details of the eyes and mouth, if you want to include them. You could also just leave them out and make the candy look more realistic. You could combine any number of colors making these candies appropriate for various seasons (red, orange and yellow for fall, for example) or holidays (pink and purple for Easter, red and white for Christmas, etc.). 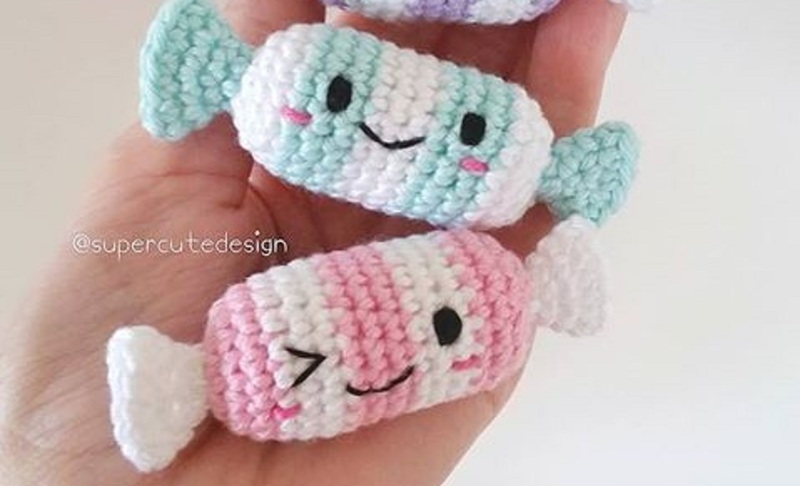 If you’d like to try your hand at making one or a whole batch of these cuties, you can find the free pattern at Jennifer’s site, Super Cute Designs.